from the then-Allegheny Square Plaza. 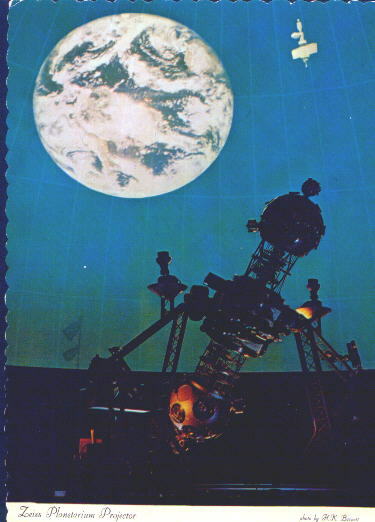 The 2014 February edition of North Side Pittsburgh's monthly newspaper, The Northside Chronicle, includes a feature article on the 75th year of Pittsburgh's Buhl Planetarium on page 12. In addition to this article appearing in the print edition of the newspaper in 2014 February, it also was posted on the newspaper's web site on 2014 January 30 and appeared in their Weekly eEdition, e-mailed to subscribers each Thursday, also on January 30. The following are the first few paragraphs of this feature article, authored by Staff Writer Kristin Douty. Then there is an Internet hyper-link to the rest of the story on The Northside Chronicle web site. This year, the Buhl Planetarium – Northside’s astronomical observatory and historic landmark – turns 75 years old. The landmark has accumulated an impressive history since it opened in 1939, when it was one of the earliest museums of the physical sciences in the country and the first institute in the country to design a sound system to accommodate hearing impaired visitors. Although the original building currently houses the Children’s Museum of Pittsburgh, 10 Children’s Way, Buhl Planetarium was once a standalone organization and beloved by the local community. The planetarium’s Octagon Hall originally displayed now-famous exhibits, including daily, public demonstrations of the one million volt Oudin-type Tesla Coil, a machine that produced man-made lightning. Pittsburgh native Walsh has documented the history of Buhl Planetarium since his childhood.